You are here: Home / Daily Stock Screens / Challenging the 200-d m.a. Today’s screen is covering stocks that are trading below the 200-d m.a. and are currently attempting to challenge the line for the first time since their fall from 52-week highs. The first failed attempt to recover the 200-d m.a. is typically an opportunity to short or a signal to buy put options. However, historical charts show that the likelihood of an ideal short setup comes when the 50-d m.a. is trading below the 200-d m.a. By the time the 50-d m.a. crosses below the 200-d m.a., a second challenge is taking place and this is where I look to initiate a position. I will be watching these stocks for that type of opportunity. NUVA – 33.92, screened a couple weeks back as the stock is now trading below the 200-d m.a. The stock is now trending back towards the 200-d m.a., also known as the next ideal short setup. DECK – 105.23, the stock has moved from $89.88 to $102 over the past few days as it looks to challenge the 200-d m.a. for the first time. A failed attempt to recover this line will be the first short setup/ opportunity. I would like to see the 50-d m.a. fall below the 200-d m.a. before initiating a position. 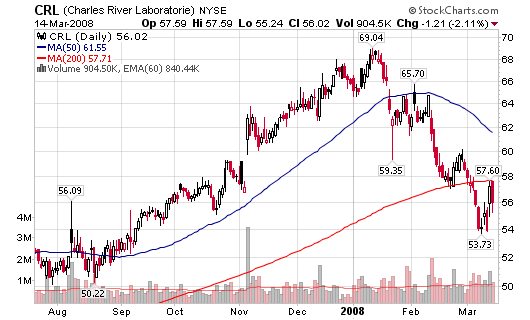 CRL – 56.02, Charles River is in the same boat as FLIR and DECK as the 50-d m.a. is still trading above the 200-d m.a. 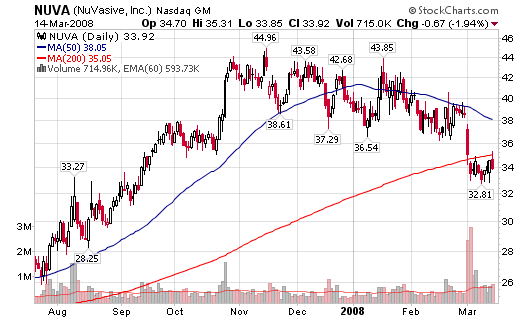 The stock reversed on Friday as it attempted to recover the line. 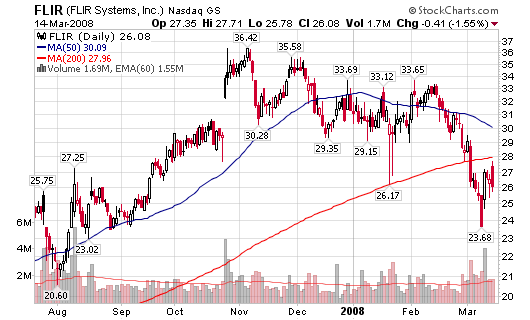 OII – 61.30, the stock was up almost 3% on Friday on strong volume but the 50-d m.a. recently crossed below the 200-d m.a. The downturn of the 200-d m.a. is still premature but the overall trend seems ot be turning downward. 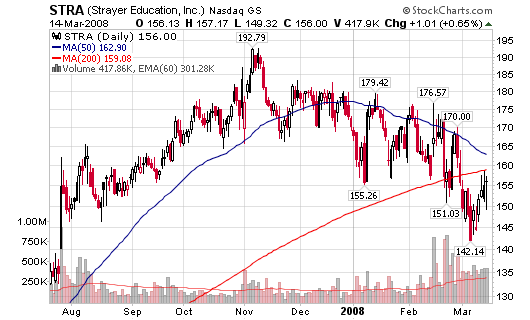 STRA – 156.00, the strong education stock is starting to hit hard times as the 50-dm.a. is trending downward towards the 200-d m.a. The price is currently challenging the 200-d m.a. for the first time in years. If you include today’s drop, Altria (MO) looks interesting as a potential Short … using a 10 week & 30 week MA setup. 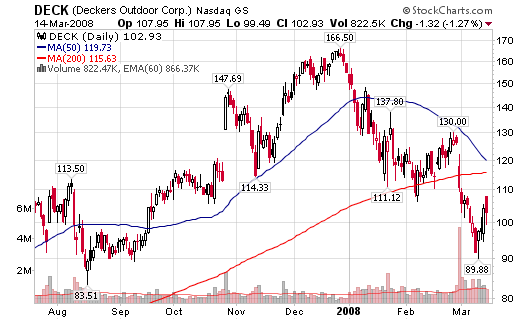 Also, (MO) closed below it’s 200-Day EMA on Friday and is significantly below it today. Quite a bit of room between the 50 EMA and 200 EMA, but a failed challenge might be interesting. The Weekly of (MO) also shows a break in an almost 2 year trend-line (gapped today). Not that I’m stock picking … I just noticed (MO) as I was reading your blog post this morning. What’s your thought on AMZN as a short(http://stockcharts.com/h-sc/ui?s=AMZN&p=W&b=3&g=0&id=p31646934184), a chart very similar to the ones you have shown? Can you suggest any free or low-cost subscription software/websites which can generate email alerts for a watchlist of stocks when they make the crossovers patterns you focus on viz. 10-week 30-week MA crossover etc. The alerts at the brokers I have accounts at (TDAmeritrade, Schwab, Fidelity) can’t nor can their trading platforms (TD’s StrategyDesk, Schwab’s StreetSmart, Fidelity’s WealthLab). I found one ad supported free software, HingeFire, which generates on-screen alerts for a select set of MA & EMA crossovers with delayed data, but only for daily MA/EMA and no 10-week/30-week crossover. On 11-Mar, AMZN traded between 64 to 67, and now it is over 69. 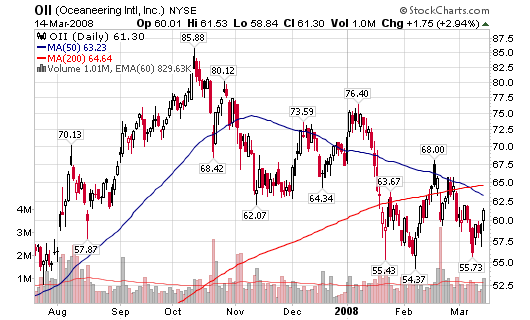 AMZN has been a stubborn ones among so many high-fliers which have deflated, especially considering Bill Miller of Legg Mason’s so many dud picks (CFC for one – “doubling up” in Nov’07 for over $15). You would think the fund should be facing redemptions and the AMZN may have more supply than demand in due course. I run screens each night through stockscharts.com using crossovers (their advanced package – $19.95 per month). I don’t do it real time because it is not necessary in my trading.